Data science and machine learning can be applied to solve many common business scenarios, yet there are many barriers preventing organizations from adopting them. Collaboration between data scientists, data engineers, and business analysts and curating data, structured and unstructured, from disparate sources are two examples of such barriers – and we haven’t even gotten to the complexity involved when trying to do these things with large volumes of data. Recommendation engines, clickstream analytics, and intrusion detection are common scenarios that many organizations are solving across multiple industries. They require machine learning, streaming analytics, and utilize massive amounts of data processing that can be difficult to scale without the right tools. Companies like Lennox International, E.ON, and renewables.AI are just a few examples of organizations that have deployed Apache Spark™ to solve these challenges using Microsoft Azure Databricks. We are excited to announce improvements in the capacity and scalability of standard Azure storage accounts, which greatly improves your experience building cloud-scale applications using Azure Storage. Effective immediately, via a request made to Azure Support, Azure Blob storage accounts or General Purpose v2 storage accounts can support the following larger limits. The defaults remain the same as before. Hey you, data whiz! You’re an expert, a data aficionado, a steward of a finely tuned database – but not everyone gets it. Well, we do. #SQLDataWins celebrates professionals who make an impact with data every day. Play along with us on Twitter by responding to our weekly tweets. It’s that simple. Every Monday at 9:00am PT @SQLServer will tweet out a fun data-related scenario. We want to see your reaction in the form of a GIF, because, who doesn’t love a good GIF? Reply directly to the weekly tweet by Thursday at 11:59pm PT with your favorite GIF and include the hashtags #Sweepstakes #SQLDataWins in your tweet and you’ll be entered to win* an awesome SQL Server prize pack! A couple pro tips: You must be a legal resident of the 50 United States, and be sure to come back to @SQLServer every week for a brand-new scenario and another chance to win. 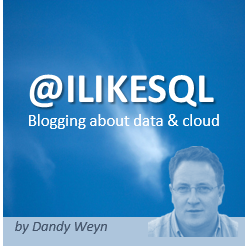 Looking to brush up on all things SQL Server and keep on winning with data? Check out these helpful resources to keep your data game on point. Hey you, data whiz! Youre an expert, a data aficionado, a steward of a finely tuned database but not everyone gets it. Well, we do. #SQLDataWins celebrates professionals who make an impact with data every day. Play along with us on Twitter by responding to our weekly tweets. Its that simple. Every Monday at 9:00am PT @SQLServer will tweet out a fun data-related scenario. We want to see your reaction in the form of a GIF, because, who doesnt love a good GIF? Reply directly to the weekly tweet by Thursday at 11:59pm PT with your favorite GIF and include the hashtags #Sweepstakes #SQLDataWins in your tweet and youll be entered to win* an awesome SQL Server prize pack! A couple pro tips: You must be a legal resident of the 50 United States, and be sure to come back to @SQLServer every week for a brand-new scenario and another chance to win. A flexible new way to purchase Azure SQL Database – Recently announced with SQL Database Managed Instance, the vCore-based purchasing model reflects our commitment to customer choice by providing flexibility, control, and transparency. As with Managed Instance, the vCore-based model makes the Elastic Pool and Single Database options eligible for up to 30 percent savings with the Azure Hybrid Benefit for SQL Server. SQL Database: Long-term backup retention preview includes major updates – The preview of long-term backup retention in Azure SQL Database, announced in October 2016, has been updated with a set of major enhancements based on customer feedback requesting more regional support, more flexible backup policies, management of individual backups, and streamlined configuration. This blog post was authored by Tad Brockway, General Manager, Azure Storage and Azure Stack. 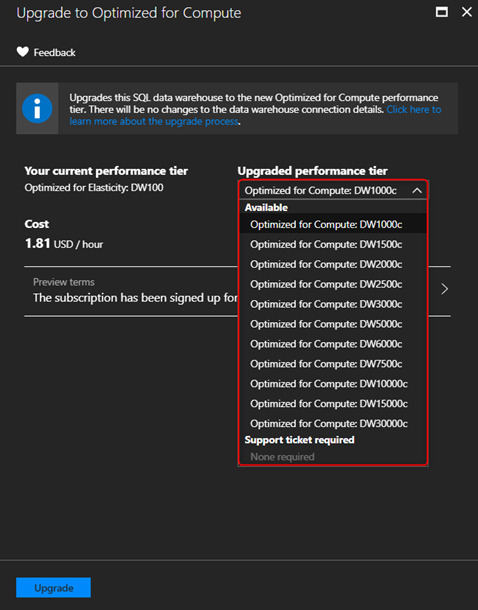 Azure SQL Data Warehouse recently announced the preview release of the Optimized for Compute performance tier providing customers with an enhanced offering of the service. With this major release, the service now has a 5X increase in compute scalability and unlimited storage for columnar data. Along with the increased capacity, customers are realizing an average increase of 5X in performance for query workloads. For existing Optimized for Elasticity customers wanting to capitalize on these benefits, there is now an option to seamlessly upgrade via the Azure Portal. The easy to use upgrade experience via the Azure Portal has no downtime associated with exporting and reimporting of the data.